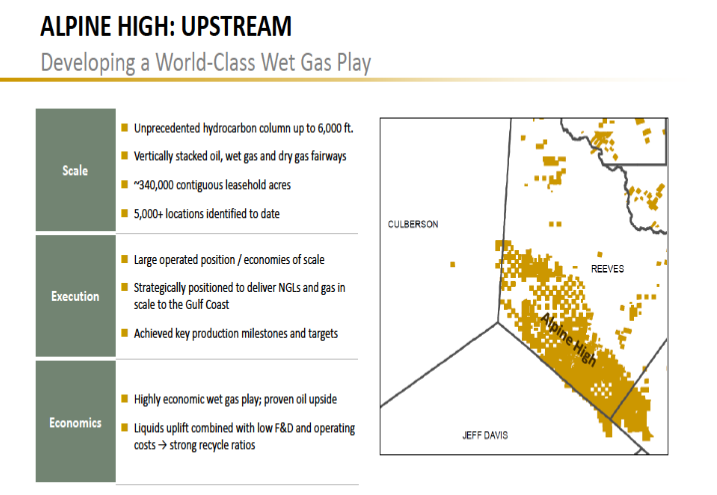 On September 7, 2016, Apache Corporation announced in The Wall Street Journal they had discovered the equivalent of at least two billion barrels in a new field in West Texas called the Alpine High. In the oil and gas business, most of these new discoveries are met with skepticism (remember the Cline shale? ); however, the Alpine High’s results are steady and surprising, and activity continues to increase. When the discovery was announced in 2016, only 46 permits were filed in the Alpine High area. In 2017, that number rose to 148. As of July 2018, 118 wells have been permitted, with 14 active rigs currently running. With the Alpine High’s continued successful well results and increased activity, a lot of that activity is moving farther south. The leader of the pack is Apache Corporation. Using resources from Drillinginfo’s recent acquisition of 1Derrick’s research and database business, information can be easily accessed from a recent Apache investor presentation where the Alpine High was analyzed in detail. 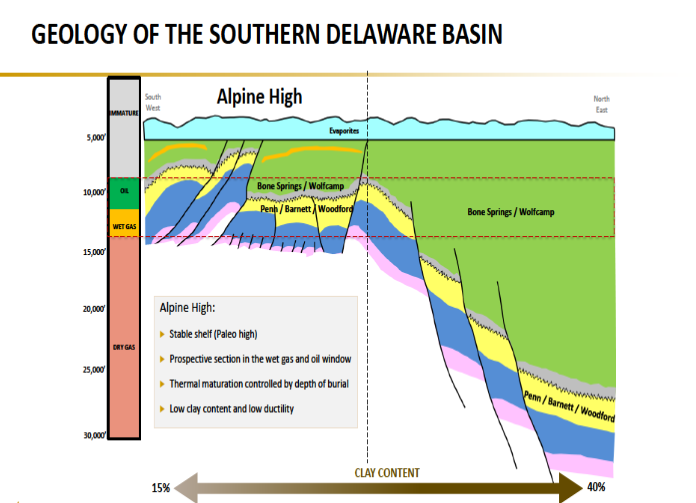 As you can see in the slide below, Apache is viewing the geologic makeup of the Alpine High as a condensed version of what you find farther east in the Delaware Basin. Essentially, at shallower depths, operators can frack multiple pay zones with cheaper well costs. Apache has increased their lease position to over 340,000 contiguous acres and has identified over 5,000 drillable locations in the Alpine High. Other large operators have followed suit. The Alpine High provides cheaper lease prices than the Delaware, Central, and Midland Basins. 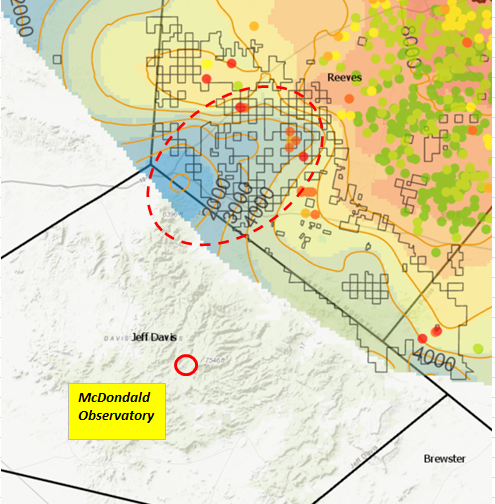 From Drillinginfo’s landtrac lease coverage, many other operators have acquired large positions in the area near the McDonald Observatory. With all this continued activity in the area, light pollution in the heart of the Davis Mountains of West Texas is increasing. 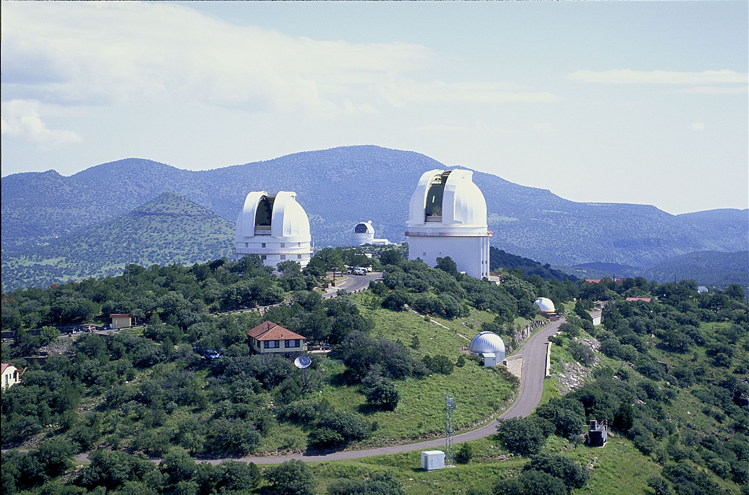 Located atop Mount Locke and Mount Fowlkes and under some of the darkest night skies in the continental United States sits the 500-acre world renowned University of Texas at Austin McDonald Observatory. The Observatory’s mission is to inform, educate, and inspire through their public programs, and support the teaching of the science and hobby of astronomy. The second largest employer in Jeff Davis County, the Observatory hosts more than 100,000 visitors each year. Through a campaign of education and awareness, the Observatory’s Dark Skies Initiative seeks to protect the beautiful, Milky Way-filled night skies of West Texas for ongoing astronomical research and education. To protect the dark skies surrounding the Observatory, the seven counties surrounding the campus have outdoor lighting ordinances and all the cities within these counties have similar municipal ordinances. In recent years, the increase of oil and gas activity in the Permian Basin has resulted in an increase of light pollution that threatens the dark skies. To measure the increase in light pollution surrounding the Observatory, all sky photometry data is collected to determine the rate at which the night skies are brightening. To address light pollution coming from the Permian, the Observatory has partnered with the Permian Basin Petroleum Association and the Texas Oil & Gas Association to publish a “Recommended Lighting Practices” guide and accompanying training video in partnership with Apache Corporation that oil and gas companies in the Permian can utilize to properly implement dark skies friendly lighting practices. Dark skies-friendly lighting has been found to not only reduce light pollution, but also to efficiently and effectively increase visibility and worker safety on oil and gas operations by reducing glare. Additionally, dark skies-friendly lighting consumes less electricity by redirecting previously wasted up-light to the ground, allowing for the use of lower wattage bulbs—saving an average of 80% in power consumption. An example of dark sky friendly lighting at Apache Corporation. Lights are aimed down on the working area, full cutoff fixtures are used, and light temperature in amber in color. In February 2016, the Texas Railroad Commission issued a notice for oil and gas operators in the seven counties surrounding the Observatory about the best practices outdoor lighting. They stated that “the solutions are simple and cost effective and can actually improve nighttime visibility and worker safety.” The “Recommended Lighting Practices” specifically targets oil and gas operations in the seven counties with existing outdoor lighting ordinances surrounding the McDonald Observatory: Brewster; Culberson; Hudspeth; Jeff Davis; Pecos; Presidio; and Reeves. However, the recommendations can be beneficial across the industry. The growing number of partners includes: Permian Basin Petroleum Association; Texas Oil & Gas Association; Anadarko; Apache Corporation; Apollo Energy Services; Cactus Drilling; Capstar Drilling; Chevron; Cimarex Energy Co.; Helmerich, Payne, Inc.; Light Tower Rentals; Mark West Energy Partners, L.P.; Nabors Industries, LTD.; Patterson-UTI Drilling Co.; Pioneer Energy Services; Precision Drilling; and Sidewinder Drilling, LLC. Bill Wren, Special Assistant to the Superintendent at the McDonald Observatory, who spearheads the Dark Skies Initiative, invited Drillinginfo’s Carl Olsen and his wife Megan to the Observatory in 2014 and again in 2017 for private tours. During the detailed and informative tours, Bill explained the importance of the Dark Skies Initiative and the work he is doing with oil and gas operators in the region to help spread education and awareness. Bill utilizes Drillinginfo’s various tools to monitor activity in the surrounding area and find operators who could implement better lighting practices in order to limit light pollution in West Texas. William Wren, Special Assistant to the Superintendent. 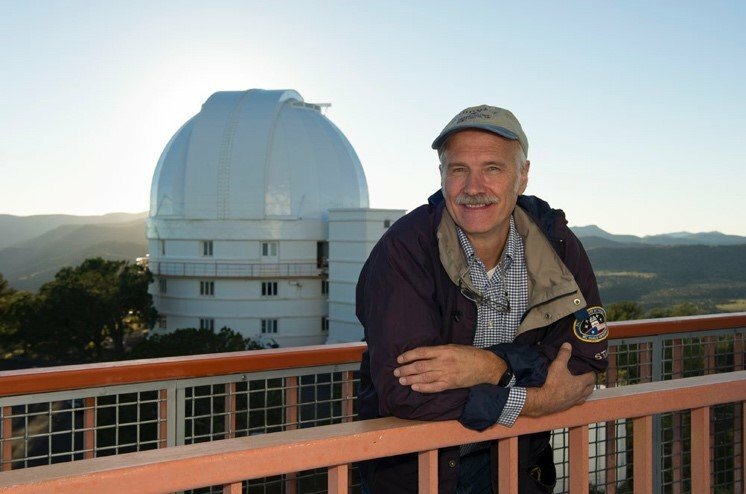 Bill Wren began working at McDonald Observatory in 1990. He is a veteran supernova researcher, helped design, build, and operate a number of unique telescopes, and now leads the effort to protect the Observatory’s dark night skies. In April, the Observatory’s Dark Skies Initiative was named one of six Texan by Nature Conservation Wranglerprojects for 2018, recognizing innovative and transformative conservation projects across the state of Texas. Texan by Nature (TxN), a Texan-led conservation nonprofit founded by former First Lady Laura Bush, brings business and conservation together through select programs that engage Texans in stewardship of land and communities. 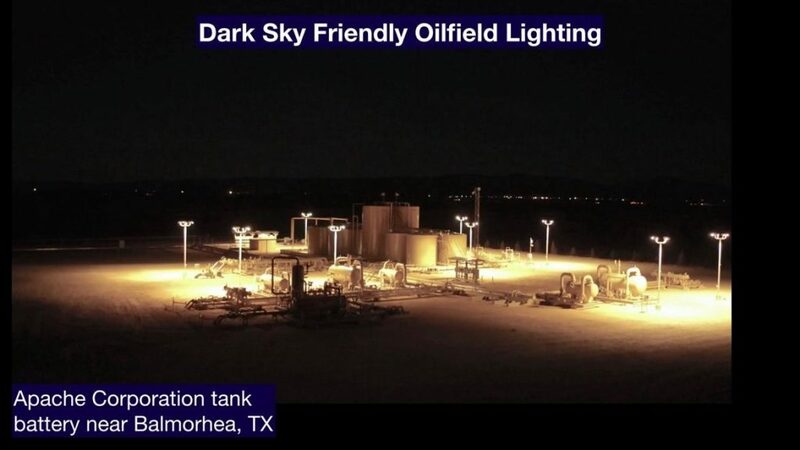 TxN is working to connect every oil and gas operator in the Permian–and in the state–to the Observatory in order to spread education and awareness of the positive benefits of the Dark Skies Initiative and encourage oil and gas operators to adopt the “Recommended Lighting Practices”because good conservation is good business. Additionally, Texan by Nature is excited to recognize oil and gas operator’s dark skies initiative efforts through their TxN Certification program—learn more here! 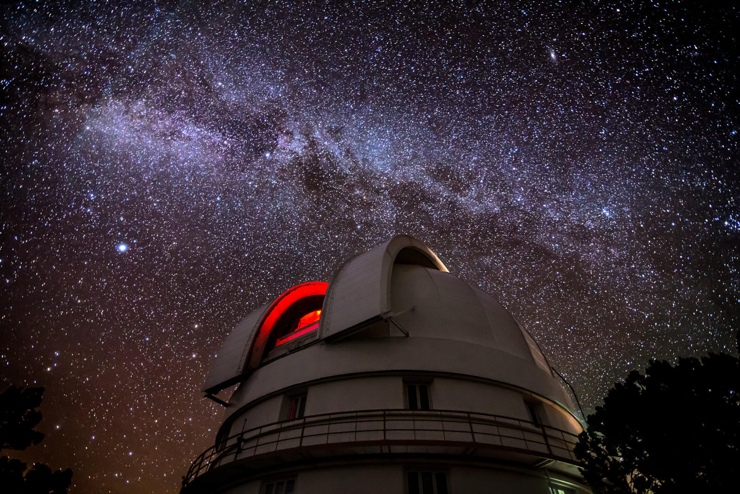 The McDonald Observatory sits under some of the darkest night skies in the continental US, where the milky way can be seen. TxN will be hosting their first annual Conservation Wrangler Summit and Celebration, on October 29th in Dallas, TX at the Bush Center. It will highlight business and conservation working together. The summit will celebrate what it takes to make a lasting impact for our people, natural resources, and economy. It will be an opportunity for conservation and business leaders to connect, learn from one another, and take inspiration and best practices back to their organizations, land, and life. Bill Wren from the McDonald Observatory will be speaking about the Dark Skies Initiative at this event. Over the past two decades, Bill has worked with various municipalities and businesses and has been featured in numerous publications including Texas Monthly and The Houston Chronicle. In 2016, Bill was featured on the nationally syndicated CBS News “Sunday Morning” program, sharing his passion for preserving the night sky in West Texas. As oil and gas activity in the Permian Basin moves farther south, it is important to education oil and gas operators on the benefits of the Dark Skies Initiative—a win-win for everyone involved. The oil and gas activity in the Alpine High will continue long into the future. As these operators unlock abundant amounts of energy that will continue improving the global quality of life, it is important that oil and gas operators in this region are aware of the McDonald Observatory’s Dark Skies Initiative and educated on how to implement “Recommended Lighting Practices” properly on their sites to not only increase their workers visibility and safety, but to protect the McDonald Observatory and to preserve the dark skies for generations to come. Exploration and delineation activity–especially with regard to delineating gas oil ratio trends to determine takeaway capacity needs–has obviously not yet ramped up to full production mode. 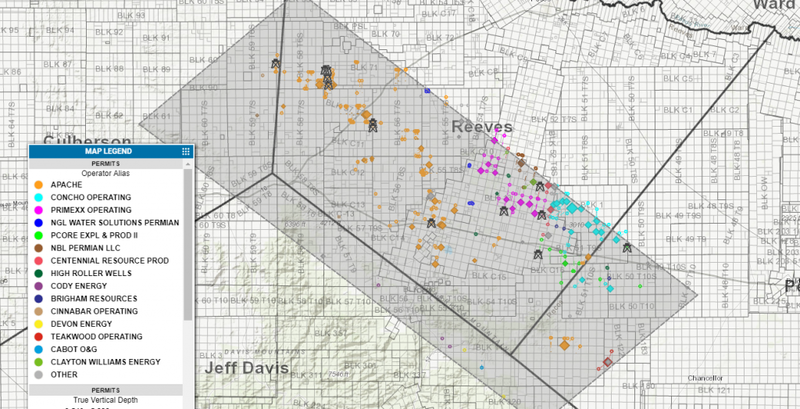 Once those answers are in, drilling and completion operations should accelerate, as the map below showing Apache’s acreage position on the Alpine High implies. 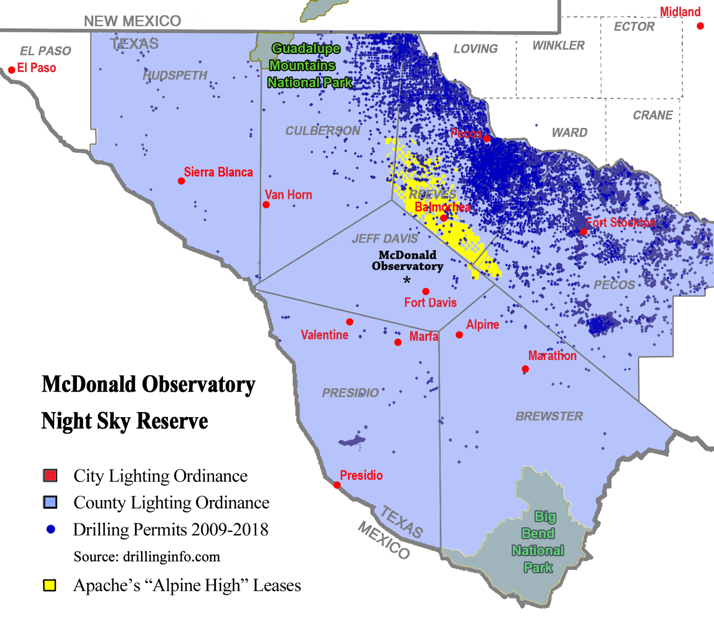 Operators need to do their part to minimize the lighting interference that compromises the McDonald Observatory’s mission.